For some people, Memorial Day is just the weekend the pools open, marking the beginning of another long, lazy summer. The grill's fired up in the backyard, and later fireflies will wink off and on in the gathering twilight as kids break out the balls and nets for some not so serious fun. While it's true that Memorial Day is a traditional time for family gatherings, this is one holiday whose original meaning shouldn't be let go. Memorial Day was first celebrated after the Civil War, when families on both sides of the conflict took a time for remembering the thousands and thousands of men who lost their lives in war. In the years to follow, Memorial Day would come to be a day to remember soldiers lost in all wars, includingthe Spanish-American War, World War I, World War II, Korea, Vietnam, Afghanistan, and the Gulf wars. Has a member of your family fought in a war? There's a good chance that he or she has memories to share with you of what it was like back then. Your family may have someone who is in service now. Remember when they come home to ask them for their stories. You can write down those memories and keep them as part of your family history. 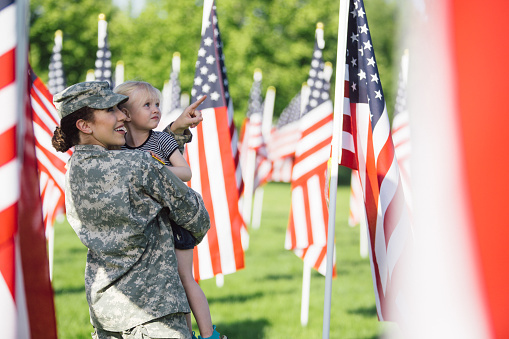 There's no need to take all the fun out of Memorial Day weekend, but you can get a better understanding of the reason for its celebration by attending a Memorial Day service. There are military cemeteries throughout the United States, and most will have some kind of special program that day. If it's not possible to go to a service, look for PBS' National Memorial Day Concert, usually to be broadcast on the Sunday evening before Memorial Day.